Perpetual economic growth is physically impossible on a planet with finite resources. Many concerned with humanity's future have focused on the concept of "sustainable development" as an alternative, as they seek means of achieving current economic and social goals without compromising the ability of future generations to meet their own goals. Sustainable development brings together elements of economics, public policy, sociology, ecology, resource management, and other related areas, and while the term has become quite popular, it is rarely defined, and even less often is it understood. Each section is introduced with an essay by one of the volume editors that provides an overview of the subject and a summary of the mainstream literature, followed by two- to three-page abstracts of the most important articles or book chapters on the topic. A Survey of Sustainable Development is the sixth and final volume in the Frontier Issues of Economic Thought series produced by the Global Development And Environment Institute at Tufts University. Each book brings together the most important articles and book chapters in a "frontier" area of economics where important new work is being done but has not yet been incorporated into the mainstream of economic study. 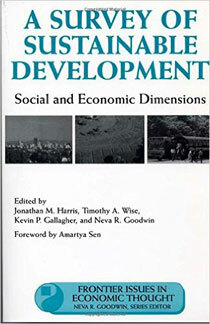 The book is an essential reference for students and scholars concerned with economics, environmental studies, public policy and administration, international development, and a broad range of related fields.